cove, where you can dive and sunbathe. Recommended to sea lovers, which in the evening look for entertainment and fun in the sparkling nightlife of Costa Smeralda. 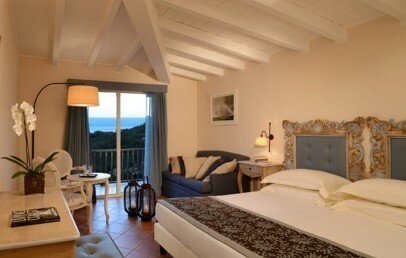 CPH Pevero Hotel is located in the famous Costa Smeralda, in Porto Cervo (Pevero location), just 30 km from Olbia. Set among the gentle hills and surrounded by thick vegetation of the Mediterranean scrub, the hotel is a paradise of harmony and peace. Modern and refined, just 250 meters from the beach, CPH Pevero Hotel is the right mix between modernity and tradition. The overview is unique in the world: the emerald green sea, the particular and fascinating rocks, the white beaches envied by all the world, everything is crowned by the colours and the smells of the typical Mediterranean scrub. A bucolic and exclusive setting, completed by the attention and care to the details offered by the hotel staff, always available and careful to meet your every need. CPH Pevero Hotel consists of different floors and offers its guests many services. The 100 rooms, most of them with sea view, provided by the latest technologies in order to guarantee guests' comfort, as well as a spacious veranda, from which you can enjoy a privileged view on Pevero Gulf. For special needs, the hotel has 2 rooms able to accommodate disabled people. The rates include towels and sunbeads at the Pevero beach and the shuttle service to the Porto Cervo city center at set times. The B&B rate includes a breakfast buffet until 10:300, towels and sun beds on the beach of the "Golfo Pevero", internet connection and shuttle service for the centre of Porto Cervo at scheduled times. The half board rate includes also the dinner at Atmosphera Restaurant. 3-course menu (dress code required). The nearest beach is about 250 meters away; it is equipped with sun beds, umbrellas and beach towels for rest moments but also with the possibility to practice sports and water activities. After a sunshine bathe and a shopping tour, for a perfect holiday you cannot miss a little time to pamper your senses with one of the several massages proposed by the wellness centre, run by experienced and safe hands of qualified professionals, or just with a relaxing beauty treatment for the health of your body. For the perfect fit, the CPH Pevero Hotel offers many possibilities: the Technogym equipped fitness center and the opportunity to practice Golf at the Pevero Golf Club, Horse riding, lessons and sailing boat trips, deep sea fishing and diving. The Resort feature 3 restaurants: Le Piscine, Atmosphera and Zafferano. Located on the second floor and open for external guests too, the Zafferano Restaurant, overlooking the romantic illuminated waterfalls, is available to guests for à la carte dinner. It is the flagship of the hotel and offers unforgettable sensorial experiences, thanks to the traditional cuisine with a modern twist. The Restaurant Le Piscine offers a rich breakfast buffet and lunch. Finally, Atmosphera Restaurant, open for dinner for guests in Half Board, has a different menu every day, rich in dishes from the regional and Mediterranean tradition. Pets allowed on request, in the Deluxe rooms or higher categories, for a fee. Max. 5 kg. Cosy and bright double room characterized by tiled floor and refined furnishings in shades of natural wood. The bathroom has a shower or a bath tub and hairdryer. 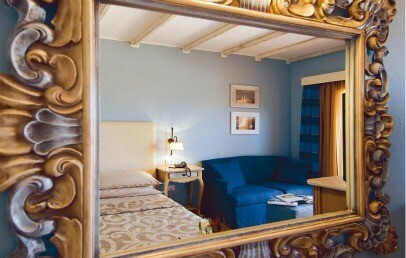 The Classic rooms provide a garden view balcony with a wrought-iron table and chairs. Connecting rooms upon request and availability. Cosy and bright double room characterized by relaxing pastel tones, that go from pale pink to blue, tiled floor and refined furnishings in shades of natural wood. The bathroom has a shower or a bathtub and hairdryer. 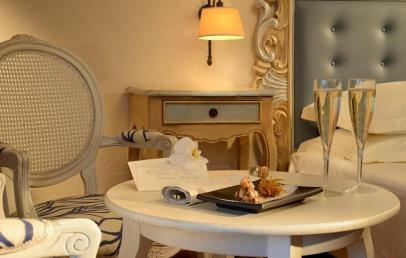 The Superior rooms provide a sea view balcony with a wrought-iron table and chairs. Connecting rooms upon request and availability. Large and elegant double room characterized by relaxing pastel tones, that go from pale pink to blue, tiled floor and refined furnishings in shades of natural wood. The bathroom has shower or bathtub and hairdryer. The Deluxe rooms provide a spacious sea view veranda with sunbeds. Connecting rooms (Family) upon request and availability. Each room is caracterized by tiled floor and refined furnishings in shades of natural wood. 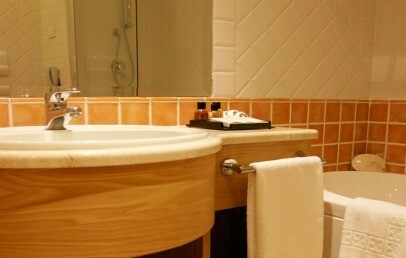 Each bathroom has a shower or a bathtub and hairdryer. The Classic rooms provide a balcony with a wrought-iron table and chairs. Two cosy and bright communicating Superior rooms (from 24 sq.m. each). Each room is cosy and bright double room characterized by relaxing pastel tones, that go from pale pink to blue, tiled floor and refined furnishings in shades of natural wood. The bathroom has a shower or a bathtub and hairdryer. 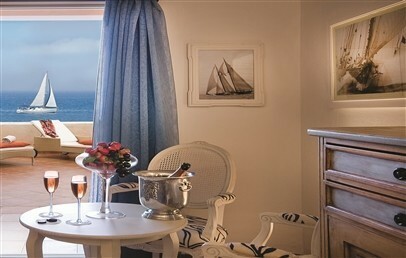 The Superior rooms provide a sea view balcony with a wrought-iron table and chairs. Refined Suite consists of two areas which can be separated by a sliding door. The bedroom and the living room present tiled floor and refined furnishings in shades of natural wood. The lounge area provides a sofa bed and several comforts. The 2 bathrooms have one a Jacuzzi tub and the second a shower. The Executive Suites face a large terrace equipped with sunbeds and has enchanting views over the Pevero Gulf. Two cosy and bright communicating Deluxe rooms (from 26 sq.m. each) characterizedby relaxing pastel tones, that go from pale pink to blue, tiled floor and refined furnishings in shades of natural wood. The bathroom has a shower or a bathtub and hairdryer. 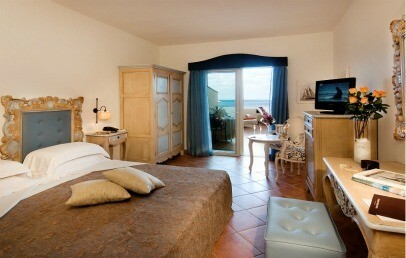 The Deluxe rooms provide a spacious sea view veranda with sunbeds.